Wooden acorns are easy, quick and the amount of designs seem to be infinite. Whether you want to make them as gifts for family or make them as hot selling craft fair items, you can't miss with acorn lidded boxes. 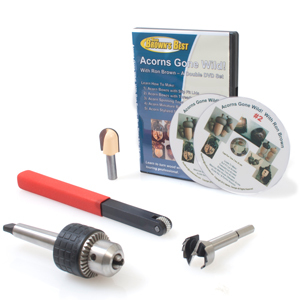 The Acorn Turning Kit includes a 2 disc DVD where Ron Brown show you how to hand chase threaded lids, get a perfect slip fit on another type and even make salt and pepper shakers stylized like acorns. You will be fascinated with these small lidded boxes.